Overall, beginning a new year with record highs in the markets feels much better than the rocky start we experienced in 2016. Many of the fundamentals seem to point to an economy that is picking up speed—but only time will tell how our new presidential administration’s policies will affect us in the future. A simple recipe for a classic snack! Thoroughly wash all apples. If the skin is waxy, scrub them with a produce brush. Cut the apples in quarters, leaving the skin and core. Place all apple pieces into a slow cooker. Add 1 cup of apple cider. Cover with lid and cook until apples are soft. Once apples are soft, mash them with a potato masher until pulpy. Press the pulp through a sieve or run through a food mill until the pulp separates from your puree. 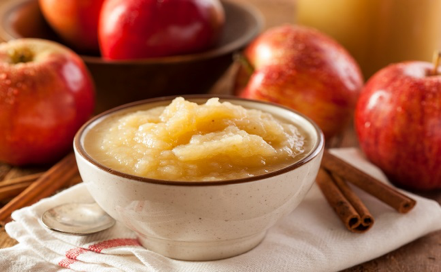 Taste the apple puree. If you like it sweeter, add sugar to your preference. Add the dash of cinnamon, to taste, if you like a hint of spice. Serve immediately or store in refrigerator. Canning this recipe is possible using standard water-bath methods, and you can store it for up to one year. In order to deduct your travel expenses, you must first make sure that the organization is a qualified charity. Generally, all churches and government entities are qualified. Ask the organization of their charity status before you donate any time or check an organization’s status by using the Select Check tool provided by the IRS. When you donate your time or provide services to a charity, you’re unable to deduct the value of this work, including any income you lose as a result of serving as an unpaid volunteer. Be aware that you can’t deduct some travel expenses. An example is when you travel for charity but devote a large portion of your trip to recreation or a vacation. Consult with your tax advisor on the specific travel expenses that you can’t deduct. Going far off the fairway and finding your ball stuck in the trees is never fun—but if this happens to you, you’re not alone. Everyone experiences this frustration eventually. To fix the situation, you need to be able to hit a great punch shot. Here are a few tips to get you back on the fairway. Find the widest gap that you can hit through. Why? Threading the ball through a tight gap will more than likely result in you remaining stuck in the trees rather than clearing them. Identify the trajectory you need to hit the ball and get out of the trees cleanly. More than likely, you’ll need to keep low. Use a low-lofted club, played back in your stance. Hit the ball with a swing that is short, smooth, and controlled to avoid hitting fast and flying the ball high. Glass Jars: You may only be able use that spaghetti sauce once, but your glass jar can live on. Thoroughly wash the jar, peel off the label, and use it for storing items in your pantry, such as dry beans or flour. You can also use jars to hold bathroom toiletries like cotton balls—or even repurpose them into glass lanterns. If you can imagine the storage, a glass jar can probably do the job well. Brown Paper Bag: At its heart, the brown bag you get in your grocery store (when you forget to bring your reusable shopping bags!) is really just paper. From covering your children’s school textbooks to wrapping presents to creating a shipping envelope—the possibilities for reuse are limitless. Tin Can: We may only traditionally use tin cans for food storage, like beans. But these containers can serve a host of functions. Plant herb seeds in them and start an indoor garden. Decorate the outside and turn them into pen holders for your desk. You can also use them as rustic vases. Zippered Bedding Bags: Those durable plastic bags holding your new sheets can easily become the perfect organizing tool. From storing your kids’ small toys to holding toiletries for your airline travels, you really can reuse this packaging in countless ways.